Mon, Apr 8, 2019, 09:24 pm SL Time, ColomboPage News Desk, Sri Lanka. Apr 08, Colombo: Sri Lanka and India have agreed to increase cooperation in security and defense spheres in several areas, including regional security, curbing drug smuggling and human trafficking and training of members of the security forces. 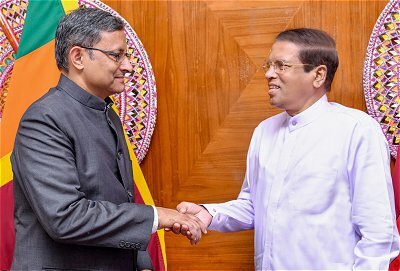 These issues were discussed when Indian Defense Secretary Sanjay Mitra called on Sri Lankan President Maithripala Sirisena at the President's official residence in Colombo on Monday (April 8). The President thanked the Indian Government for the cooperation extended to Sri Lanka in security issues and for training provided to Sri Lankan security forces personnel. He also requested to increase the number of personnel trained by India. The Indian Defense Secretary agreed to look into the possibility of enhancing training facilities. President Sirisena stressed the importance of close cooperation between the two countries to ensure regional security. They also exchanged views on issues pertaining to bilateral defense cooperation and regional security. Mr Mitra and Defense Secretary Hemasiri Fernando will continue discussions on these issues to further strengthen security cooperation between the two countries. Secretary to the President, Udaya Seneviratne and Indian High Commissioner Taranjit Singh Sandhu were also present during this discussion.